Competitive pricing consists of setting the price at the same level as one’s competitors. This method relies on the idea that competitors have already thoroughly worked on their pricing. In any market, many firms sell the same or very similar products, and according to classical economics, the price for these products should, in theory, already be at an equilibrium (or at least at a local equilibrium). Therefore, by setting the same price as its competitors, a newly-launched firm can avoid the trial and error costs of the price-setting process. However, every company is different and so are its costs. Considering this, the main limit of the competitive pricing method is that it fails to account for the differences in costs (production, purchasing, sales force, etc.) of individual companies. As a result, this pricing method can potentially be inefficient and lead to reduced profits. For example, a firm needs to price a new coffee maker. The firm’s competitors sell it at $25, and the company considers that the best price for the new coffee maker is $25. It decides to set this very price on their own product. Moreover, this pricing method can also be used in combination with other methods such as penetration pricing for example, which consists of setting the price below that of its competition (for instance, in this example, setting the price of the coffee maker at $23). As previously mentioned, competitive pricing consists of using competitors’ prices to set one’s own. According to a company’s objectives in terms of brand, penetration tactics or market aggressiveness, the exact price level can somewhat vary. For example, if a firm wants to gain market share, then its objective is to have one of the lowest prices on the market. On the contrary, if a firm wants to create a successful brand image, it would be more effective to sell higher-priced products In order to communicate a signal of quality to its consumers. Moreover, this pricing method is often used within well-established and highly competitive markets. This is due to the assumption that the equilibrium level of price is already reached in this type of market, meaning that competitors are setting their prices at the equilibrium price. This method is simple in terms of economic theory and also entails a low risk of setting an inefficient price, allowing a company to move towards an economic equilibrium. This method is simple because competitors’ prices are most often publically displayed and it is therefore easy to copy them. When products are identical or highly similar (as is widely the case in retail industries), it is often simpler to copy competitors’ prices rather than implement another pricing strategy. With this method, the firm allows its competitors to incur the costs of establishing an optimum price. This method carries low-risk. If the prices used by competitors do not lead them to bankruptcy, it will likely be the same for other firms on the market too. And while there could potentially be some punctual inefficiencies (on one specific product) resulting from this method which could then spread to the entire market, such situations are rare. This method leads to equilibrium. In the retail industry, there are millions of customers and millions of sales that take place every day. Therefore, assuming that most retail players on the market are using the competitive pricing method, the entire market can reach a stabilized equilibrium price. Firm “A” has been selling coffee makers for years and they have 2 distinct products: an entry-level product priced at $25 and a top-notch product at $50. They experimented with different prices for years before reaching this equilibrium. If the entry-level product was cheaper, firm “A” would lose margin; and if it was higher they would lose market share. The same goes for the top-notch coffee maker. Another firm – let’s call it “B” - enters the market with two coffee makers, an entry-level one and a top-notch one. The best prices to be used by firm “B” are the prices already set by firm “A”, as firm “B” can assume that “A” has identified the best prices aimed at maximizing their profit and reaching the price equilibrium. It is worth mentioning that the market for coffee makers is mature and consumer preferences are well-known. 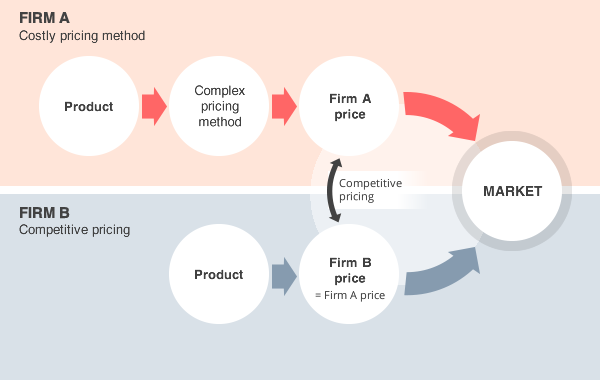 This schema illustrates the principle behind competitive pricing: it allows firm “B” to identify prices that are efficient for them without incurring any price-setting costs. Competitive pricing only works when the products sold by different firms to the same customers are pretty much identical. On the contrary, if products are just partially similar and are not exactly identical, then the price is hardly transferrable from one product to another. In this regard, the main challenges pertain to defining one’s competition, establishing congruency between products as well as collecting and analyzing data. Definition of congruency: according to classical economics, two products are congruent if a consumer can somehow replace a quantity of one product by a quantity of another product without experiencing any loss in product utility. In reality, it can be quite difficult for a retailer to define congruency when comparing its products with those of its competitors. Are the last Apple iPhone and the last Samsung Galaxy congruent? Defining congruency is the hard part of competitive pricing. Definition of competitors: defining competition is essential in order to know which prices need to be analyzed by the firm. But competition can take on various forms as an online retailer and an offline retailer can indeed be competitors in some cases, but not in others. For example, it is likely that online and offline book sellers are competitors as they are essentially serving the same customers. But online and offline food sellers cannot really be seen as competitors as their target market is not exactly the same. Therefore, before being able to set a competitive price, a firm needs to carefully identify its relevant competitors. Gathering and analyzing data: once congruent products and competitors are defined, the next step consists of collecting relevant pricing data. In one way or another, most competitors’ prices are displayed on the internet and can be “scraped” by using the necessary technology. The frequency of scraping needs to be well-defined because it varies considerably from one business sector to another. For example, on Amazon, prices can sometimes change almost every minute, but most retailers do not change their prices that often. What are the main issues with competitive pricing? The main issue with competitive pricing is that it can lead to missed opportunities as it can create a situation whereby all the players in a given market are blindly using the same pricing. This results in a static market and can also create a price war or a race to the bottom. Competitors’ prices can lead to setting a non-optimal price. Some companies must deal with fixed costs that are higher than their competitors’, meaning that they may potentially need to sell larger product volumes in order to amortize the fixed costs in question. Therefore, when using competitive pricing and setting the same prices as their competitors (who do not necessarily have the same fixed costs), these companies can find themselves in a situation where they are making a suboptimal level of profit. Taking a slightly different example, if a competitor sets an incorrect price purely due to human error (for example, adding an extra zero by mistake and setting the price at $1400 instead of $140), the wrong “competitive” price would obviously be suboptimal. Competitive pricing is used by virtually every player on the market. The market can become static as a result, and if the market price equilibrium is suboptimal, the profit of the entire market will be reduced. The price will remain at the same “competitive” level until profits reach a null value. Aggressive competitive pricing can lead to a race to the bottom. For example, a firm can decide to employ an aggressive pricing policy with a mix of competitive pricing and penetration pricing by setting the price 10% lower than its competitors. If another competitor decides to do the same thing, the overall market price will slowly decrease and the profits will decrease too. The new equilibrium will be one with lower profits and thus largely suboptimal. Competitive pricing can also lead to a race to the sky. For example, Amazon sells “printed on demand” books which web crawlers (that also operate on the Amazon Market Place) can then sell at a higher price. If a customer is willing to pay the higher web crawler price, the web crawler will simply buy the book from Amazon and make profit on the Amazon price. As a result, the web crawler intending to maximize his profit will set his price higher and higher, and other web crawlers will use the competitive pricing method to set the same higher prices which will in turn lead to a race to the sky.